Description: This is the foremost of the 108 shrines glorified by the Alwars; all of the Alwars with the exception of Madhurakavi Alwar have sung of its glory. It is the one of the greatest centers of the Sri Vaishnava religion and among the most visited pilgrimage centers in India. Undoubtedly the largest temple in India, and one among the grandest, it is a treasure house of art freezing various architectural styles over a period of time. It boasts of the tallest temple tower in India. Referred to as heaven on earth it is an ancient center of worship - vibrant with tradition and festivals. The Pancharanga Kshetrams along the course of the Kaveri are Srirangapatnam (Karnataka), Srirangam, Koyiladi (Anbil) and Kumbhakonam and Indalur (Mayiladuturai). Srirangam is very closely associated with Ramanujacharya, the beacon of the Sri Vaishnava tradition of Hinduism. Tiruvanaikka or Jambukeswaram, one of the Pancha Bhoota Stalams (associated with the primary element water) of Shiva, is located in the vicinity. Srirangam is located near Tiruchirappalli in Tamilnadu. Deities: Ranganathar is enshrined in a reclining posture (facing the South); while Namperumaal the festival deity in a standing posture is also housed in the main sanctum. There is a shrine in the fourth prakaram, housing Ranganayaki Taayaar. Traditions: Araiyar Sevai, one of the ancient devotional art traditions of Tamilnadu, involving the expressive recitation of the Divya Prabandams, using movement, music originated here under the auspices of Nadamuni (10th century CE). Araiyar sevai is performed also at Srivilliputtur, Alwar Tirunagari and Melkote (Karnataka). The famous tamil literary work Kamba Ramayanam premiered here at Srirangam. 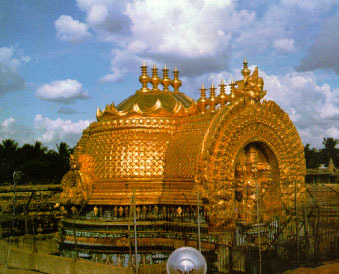 The Temple: This temple enshrines Ranganathar in the central sanctum, crowned with a gold plated Pranava Vimanam or Paravasudeva Vimanam. A total of 7 concentric prakarams surround this shrine, housing several mandapams, tanks and shrines. The area enclosed by the outermost wall is over a hundred ares. Gopurams on the south and east of the 4th prakaram are the most impressive. A total of 21 towers adorn the temple. The pillars here go back to the Chola period (13th century CE). The 1000 pillared hall is also the product of the late chola period, and is also in the 4th prakaram; its entrance is in the south. It is here where the adhyayanotsavam (involving the recitation of the Tamil Prabandam hymns) is held. At the southern edge of the huge open courtyard, the Vijayanagara rulers added the hall with 8 pillars with huge horses. The Krishna Venugopala shrine on the southern side is also of great beauty. The Garuda mandapam s located in the third prakaram.. Its pillars go back to the Nayaks of 17th century Madurai. The Chandra and Surya Pushkarini tanks are located in the 3rd prakaram. History: Temple life at Srirangam evolved after Nadamuni (923 - 1023 CE) compiled the hymns of the Alwars and gave them a musical form. During Ramanujas time (12th century CE), Srirangam was a well established institution. The Pandya rulers, from the 13th century onwards gave the temple, immeasurable support; the gold plating of the vimanam being first of their endowments. The Hoysala kings, who set up a military base outside Srirangam also made contributions. The temple was desecrated by the Delhi armies in 1313, and was closed for 60 years. From the end of the 14th century, the temple came back to life, and much of what is seen today is a result of the rebuilding activity which heppened during the time of the Vijayanagar rulers. Festivals: An elaborate protocol of worship services is offered here throughout the day. On about 120 days, the Utsavamurthy is taken out in procession out of the inner sanctum. Aadi bhrammotsavam is celebrated in Panguni. The grand Adhyayanotsavam is celebrated in the month of Margazhi, involving the recitation of the Prabandham hymns or Alwar Pasurams in the thousand pillared hall. Also in Srirangam is the Dasavataram temple, the only one of its kind, enshrining the ten incarnations of Vishnu along with Lakshmi Narasimhar and Vishwaksenar. This temple was built by Tirumangaialwar and is now under the administration of the Ahobila Mutt.. The Tirumangaimannan festival is celebrated here. Links: The Srivaishnava Home Page 1, The Srivaishnava Home Page 2, The Official Srirangam Temple website.